Two years after his victory at the Institute, Darrow au Andromedus, the Red who now lives the life of a Gold, is on the cusp of repeating the trick at the Academy, and gaining command of a fleet of Gold vessels. It is a surprise to everyone, then, when he is defeated in the final battle, and a bigger surprise to Darrow to learn that his sponsor and protector will be cutting him free following his failure to gain control of the fleet. In a race against time, Darrow must find a way to remain under the protection of House Augustus in order to stay alive long enough to progress his true mission: the downfall of the Gold’s Society from the inside. As civil war looms, Darrow will find his loyalties tested, and his own sense of identity increasingly blurred. Returning to the world and characters he created in Red Rising, Pierce Brown takes us once again into the head of Darrow, the Red miner who has turned Gold in order to help free his people. Within a handful of pages, the reader will feel comfortable with this familiar world, with the idiosyncrasies of the language, and with the relationships between the characters. Of course, it is imperative to read Red Rising first, or very little will make sense. What Brown began sketching out in that first novel on a small scale, we now see on a much larger canvas, as the author expands the scope of the story out into the solar system, much of which has been colonised by the Golds. From the old ways that we grew used to on Mars – the ancient Roman setting an effect broken only by the occasional glimpse of technology – we move into epic space opera, fleets of gleaming spaceships, giant behemoths that make Battlestar Galactica look like a lifeboat, and the threat of looming war is apparent from the outset. Much has changed in the intervening two years, and Darrow finds himself the centre of an odd circle of friends. Relations with Mustang, the girl to whom he grew close during their time in the Institute, and the daughter of his patron, are strained following his decision to enter the Academy. This is the first sign we, the reader, see that the transition from Red to Gold may have affected more than just Darrow’s body: there is a hunger for power (admittedly, we are fairly certain that it is all for the greater good, but there is still plenty of room for doubt), something that we might associate more with the Golds than with the lowReds from whence Darrow came. This is a theme that recurs throughout the novel, and Darrow frequently questions his own motives, seeing in himself a man he has no desire to be, a man his wife would not – could not – ever have loved. As the story progresses, Brown begins to drip-feed us answers to some of the questions that remained unanswered at the end of the first book: who are the Sons of Ares, for example, and what, exactly is their game plan? As friendships shrivel and die, Darrow quickly comes to understand that he has some very dangerous enemies who know a little bit too much about his origins. It becomes difficult to know who can be trusted, who is waiting to plunge the knife once his back is turned, and the reader feels as helpless as Darrow since we know only what he knows. In a shocking revelation as the story heads towards a stormy and cliff-hanging climax, Brown pulls the carpet from under our feet and completely changes the nature of the game; everything we thought we understood about what Darrow is doing, what his mission is all about, is called into question in a single moment of magic. All of the elements that made Red Rising such a special book are present and accounted for in this second outing, but the increase in scope allows Brown to play around a bit more with the ideas and concepts that make up this world he has created. Edge of the seat thrills coupled with scenes that take place on a cinematic scale make this an entirely engrossing read. Darrow, although changed from our first encounter with him, is still as engaging as ever, and it is his journey that we keep coming back for. In the tradition of the finest “middle volumes” of classic trilogies, Golden Son builds on the world created in the first volume, makes us rethink what we thought we knew, and finishes on a bang that will ensure we’re all waiting impatiently for the trilogy’s final instalment. A stunning space opera of epic proportions, Golden Son is gripping and intense at times, tender and funny at others. It takes the story begun in Red Rising in unexpected directions and manages to be that most rare of beasts: the sequel that surpasses the original. 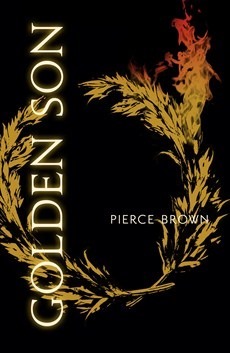 If you enjoyed Red Rising, Golden Son will knock your socks off. If you’ve yet to experience Pierce Brown’s multi-coloured world, you will definitely want to be caught up before the third volume drops next year. Either way, you won’t be disappointed. Pierce Brown is an excellent writer. I’m a bit behind, only starting to read Red Rising now!